Moonlight Dome’s most unique feature are its staterooms. Three staterooms feature side by side lower beds – no debate over who gets the top bunk! Each with private toilet and sink. A fourth bedroom features a queen bed. Hallway bathroom has the shower. 360-degree view from the dome. Seats 24 for viewing or for formal dining. It was the first of three (1850-53) private room-dome-cabin cars originally built for the C&O and intended for service on the Chessie, the planned but never-operated Washington-Cincinnati dayliner flagship of Robert Young’s fleet of projected post-World War II luxury liners on rails. The three cars were sold to the Baltimore & Ohio in December 1950. 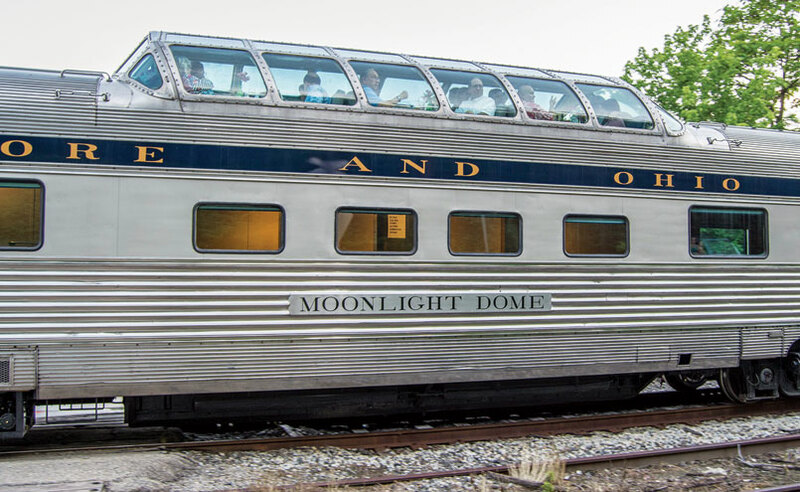 Beginning on December 20, 1950, Moonlight Dome operated on the Shenandoah until October 1963. Thereafter it became the spare car for the Capitol Limited.